I purchased this telescope for my neighbor's children as a Christmas present. As they were new to astronomy I anticipated it could take a while for them to get to grips with setting it up. I was however pleasantly surprised. The very evening I gave it to them, they set it up, even if they had a little help from their dad. The first view was of the moon which they thoroughly enjoyed. They were impressed, actual words were, it's fantastic! This model definitely struck me as a, well-made scope.The simple fact that it is so user-friendly and uncomplicated makes it a really wonderful scope. Join in and write your own page! It's easy to do. How? 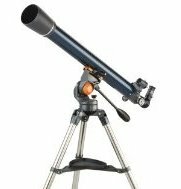 Simply click here to return to Celestron Telescope Reviews.